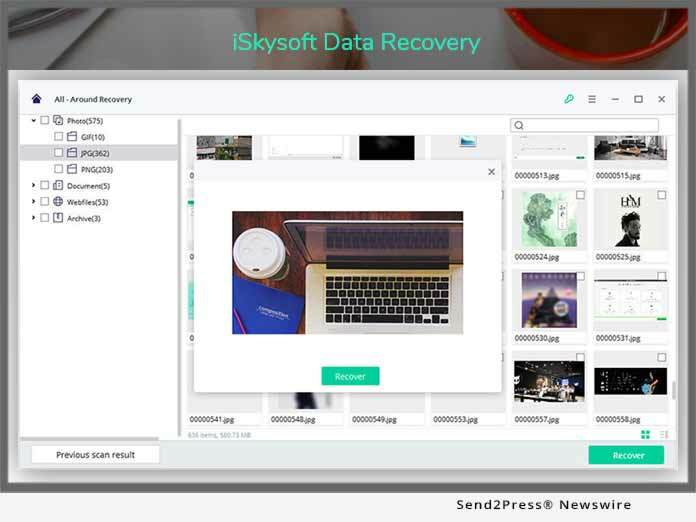 SHENZHEN, China, Jan 24, 2019 (SEND2PRESS NEWSWIRE) -- iSkysoft Data Recovery is one of the leading and proficient data recovery software available for platforms like Windows and Operating Systems (Mac). The software has been recently refurbished to provide services focusing the user interface. For, the users who have accessed the software ever before, will be able to access the newly upgraded UI. Also, the new features added during the process are the latest Intelligent System Crash Recovery Application. This tool is one of the sure-shot ways of recovering the lost, formatted or even the deleted files following a few quick steps. From accidental deletion to the virus attack to the SD Card damage, the reasons for data loss are several but the reason for the data recovery is one. The application is intently devised with the four amazing recovery modes that enable powerful data recovery. Moreover, it thoroughly scans the SD Card and gives a display option before the user opts to recover the same. The software is offering some reliable features that allow recovering over 1000 types of data easily. Users operating the software for the first time must understand the basic features and its functionalities so as to compare the older version with the upgraded one. This data recovery software enables to recover the deleted data in scenarios like sudden system crash, virus attacks, malicious software, formatted drive and more. Here, the user needs to plug the SD card on any windows or Mac PC and launch the software to restore the data. Also, the iSkysoft Data recovery works to recover files from SD card with utmost efficiency. Furthermore, the application can also revive the data from devices like external hard drives, USB drives, digital cameras, camcorders, damaged partitions and even from the unbootable dead devices. The software is easy-to-use in all aspects. It can also save the process of scanning, even when paused due to any reasons and saves the data retrieved automatically. One can continue the scanning process or even the recovery at any point in time. Additionally, the humanized preview is designed to check the files recovered the content of the documents, photos, emails etc. iSkysoft SD Card Recovery software is designed to deploy two different types of scanning process during the process of recovery- Quick Scan and the Deep Scan. Quick scan is said to be a little crisp and scans the data very quickly. It generally scans the documents, images, documents, and the overwritten text files. Whereas, the deep scan is the process with higher rates of data recovery, as it delves a little deeper into the memory of any SD Card, even if it means scanning the most inaccessible data fragments. The application can be the top 1 tool that is designed to support data recovery from unbootable Mac and Windows systems. This is process is followed by creating an accessible media under WinPE environment. Furthermore, the same does not require having the professional skills as a user. So, all the required data is restored from the unbootable device quickly. iSkysoft is a leading brand that offers smart software solutions. The company is known to provide customer satisfaction with utmost priority. With over 10 years of experience, the brand is providing multilingual interaction services for users across 230 countries and continues to spread both enthusiasm and technological updates to every nook and corner of the world. Also, iSkysoft aims to provide more than 100 million users with an easy to use the tools for better experience digitally. NEWS: CityView Commercial LLC has purchased Southlake Mall in Atlanta, Ga.